I am going on a little bit of an eating journey this week. I have been reading The Everlasting Meal by Tamar Adler. It's an amazing book. As I read, and thought, and made my plans for my vegetables this week, my mouth was literally watering. Let's hope things turn out in reality the way they are in my mind. I am only part way through it, but I had to stop right there in the middle of chapter three and do what she told me to do. If you love food, and cooking food, and eating food, this book is amazing. I am not going to say it is light reading or a page turner by any means. It is also not a cookbook that you can leaf through during spare minutes or while making your shopping list. But, it you like to enjoy great writing and amazing descriptions of food and its preparation, this book is fabulous. Her entire premise is that we ought to stop burying ourselves in recipes. We can stop having to go through a process of researching, reading, shopping, and prepping every time we want to put dinner on the table. Although the book is all about how to cook food and enjoy amazing meals, there are actually very few recipes, and very very few measurements. 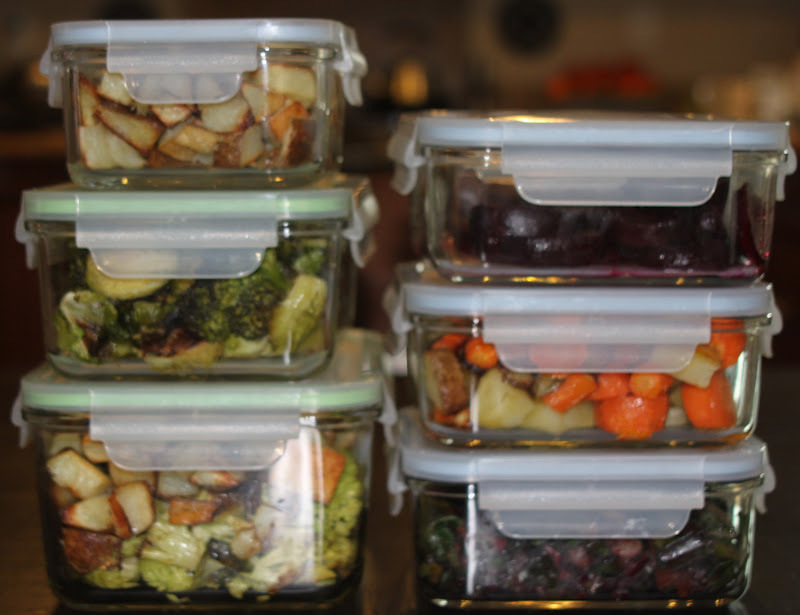 Rather, she describes what type of ingredients to use, and what ways they can be prepared. By letting each thing you cook build on the last thing you cooked, you don't ever have to find yourself standing in the kitchen at 5:00, wondering what the heck is for dinner. Tonight's dinner can most likely be built upon last night's dinner, and is therefore mostly decided upon and already partially done. At any rate, in chapter three, she describes her process for shopping for a bunch of vegetables, roasting and sautéing them all on one day, and then having prepared ingredients for a week's worth of meals. According to Tamar Adler, they will be as easy and versatile to use as a can of beans, once the initial cooking is completed. Most importantly, though, the ways she describes the meals she makes out of the vegetables... soups, salads, risotto, curries, pestos, and sandwiches, made me wish I were sitting at her kitchen table. Right. Now. Well, since I have a beautiful box of vegetables sitting here that I picked up from Abundant Harvest Organics, I decided to give it a go. I followed her instructions to roast the hefty veggies and sauté the greens on the first day. 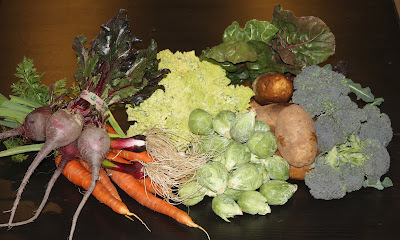 Tamar Adler lists many many different veggies to roast, and I chose to use everything in my box that seemed like a "cookable" vegetable (All that was left, besides fruit, was cilantro, napa cabbage, a salad green called mache, and arugula). I had broccoli, potatoes, cauliflower, beets, brussels sprouts, turnips, and carrots to roast. I also sautéed chard, green garlic, and the greens from the beets. I thought I was doing well with making candy out of orange peels and stock out of onion skins, but according to Tamar I am not making the most of my vegetables! She suggests saving the core and leaves of the cauliflower, the tough stems of the broccoli, the core of a cabbage or the stems of chard. These can be made into a pesto, and I will give you that recipe when I try it later this week. For now, I have dutifully set them aside and I'm saving them for their ultimate fate. 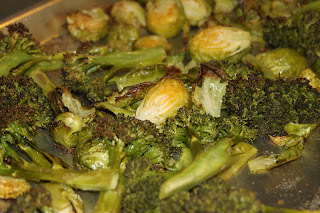 I chopped and roasted two pans that held broccoli, cauliflower, and brussels sprouts, with some whole cloves of garlic. I also chopped and roasted two pans with the root vegetables: carrots, potatoes, and turnips. Finally, I roasted a pan of beets. These need to be tented and cooked with a bit of water so they steam all the way through while they roast. Preheat the oven to 450. Scrub, peel, and chop all the vegetables except the beets. Spread each set of vegetables out on a baking sheet. The sheet can be pretty full, but they need to be in a single layer, with a bit of space between them. Toss them with some olive oil, until they are coated, and sprinkle with salt. Pop them in the oven, and after a half an hour, start checking them to see if they are done enough to make you want to keep eating. Be sure and tuck a few whole cloves (unpeeled) of garlic onto each baking sheet. Apparently we will use this later this week. This is romanesco cauliflower. More on that to come! It's wild! The beets are a bit different. Cut the greens and stems off and place them in a sink full of water, to use later with the other greens. 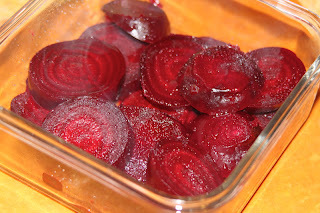 Tuck the beets, tails intact, into a baking pan, and wash them with hard running water. Tip the pan while you wash them, and allow the water to run out. 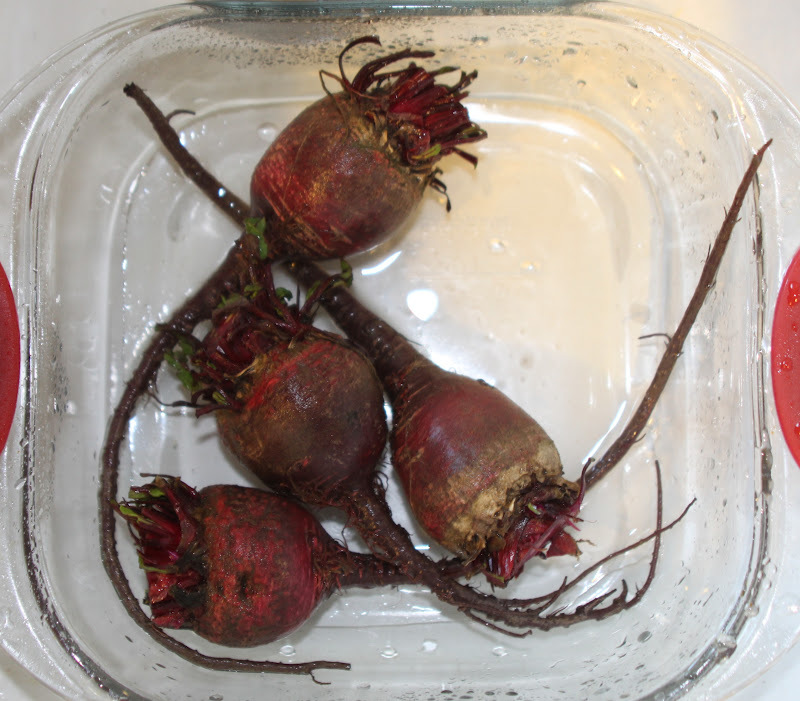 Once the waste water is clear, the beets are clean enough to cook. (Removing the skins after roasting them also removes any little bits of dirt that are left). Leave a little bit of the water in the pan, drizzle with olive oil, and and cover the pan tightly with foil. Place this in the oven. Now that all of your veggies are cooking, you may want to check them once in a while. If they are getting too brown but not soft enough, scoot them all together to build up steam. If they are getting soft but not browned, spread them out. The majority of the veggies should be done in half an hour to 45 minutes. She explains that they need to roast until they are "completely, completely tender." Rather than giving a specified time to let them cook, she says to check after a half an hour, "Test the doneness of...vegetables by tasting them. When you don't wonder, but reach to eat another, they're done." And boy oh boy was she right about that. 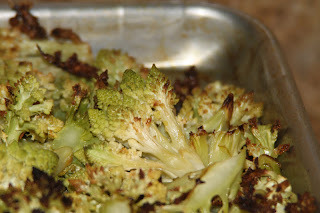 I couldn't stop myself from reaching again and again to munch on the first pan of veggies to come out of the oven while I continued prepping and cooking other things. The beets, though, are going to need a bit longer, and won't necessarily all be done at the same time. Check the beets by lifting the foil, and trying to pierce each one with a knife. If it goes in easily, pull the beet out of the oven. If not, let it keep cooking. Tamar says "If you're not sure if they're done, they're not." Be sure to re-cover the pan tightly after checking and removing any beets, so they can continue to steam. After they are done and cooled, remove the skin by rubbing it off with your fingers. Cut them into slices or wedges and then sprinkle them with red wine vinegar and salt. Once a pan of veggies finished and there is a little space in the oven, Tamar recommends placing a pan of nuts in. Let the walnuts or pecans cook for about 10 minutes, and they will come out toasted and perfect for topping a salad. 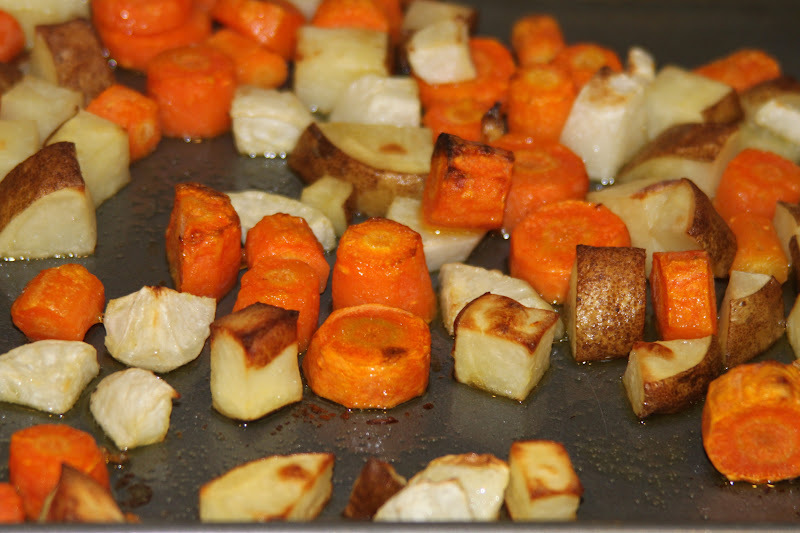 After all of the roasting vegetables are in the oven (and some may be back out again by this point! ), it's time to take care of the greens. Add any greens you have to the beet greens that are soaking in the sink. In my case it was green garlic and chard leaves (I cut the chard stems off and added them to my collection of cauliflower leaves and core and broccoli stems that I am saving for later). Swish them all around in the sink to get them clean, and then pull them out, chop them roughly, and sauté them in a little olive oil and a tiny bit of salt. Keep most of the water that clings to them after washing... they are supposed to steam more than they sauté. If they dry out while they cook, add a tablespoon of water every once in a while. Cook them in as many batches as you need to. I did two frying pans full. Tamar recommends adding chopped garlic in with the greens, but since I had green garlic I didn't want to overdo it. These are done when they are completely wilted and can be easily cut with a knife. Come back tomorrow and I'll share the first meal I made out of them! It couldn't have been simpler, and it was one of the most delicious meals I have eaten in a long long time.